Cabriole Mercedes - seen only in Albania! Home Albanian Blogger Cabriole Mercedes – seen only in Albania! Cabriole Mercedes – seen only in Albania! May be you may have seen some crazy pictures from China or Cambodia of people carrying about 2000 empty bottles of water on their bicycle or stacking a bunch of chickens on their motorcycle, or even of the horse riding in the back of the car. You know the web is full of those pictures. Well, here in Albania we do not prefer either of those versions. Instead we are a little more creative and thus have decided to go for the cabriole Mercedes – you know the opened top version of cars. 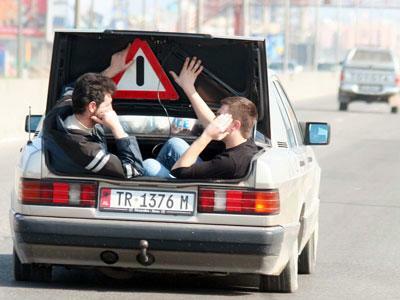 I discovered this picture just today on Peshkupauje.com and thought it was hilarious as a transportation solution. Who knows may be this thing might catch on and more people will start doing it, especially now during the summer :-). I would love to see anyone try this in the middle of the Block area in Tirana.